How to Infuse Your Personality into Your Engagement Session! Are you ready for post #2 in our engagement sessions series? If you read our first post about engagement sessions then you already know that I love engagement sessions! To sum up that first post; engagement sessions are a great way for you to get in front of the camera before your wedding day and to get to know what your photographer’s working style is like! Another great thing about them is that there's also more time to play, stretch creatively and infuse a bit of yourself into your images! Which is what this post is all about! Infusing your personality into your engagement session doesn't have to be complicated, you can think about a hobby that you enjoy doing together, maybe two hobbies that clash in a funny way, or simply a place that you like to go together. Think about what you like to do together. This couple met in a class they took together at St. Scholastica in Duluth. We started in front of this iconic building and then went to another location in Duluth to add variety to their images. Maybe the local beer scene is your jam? These two like to try new beers at different breweries around the Twin Cities. So after taking some photos at a local park, we headed to Utepils for some images in their tasting room. 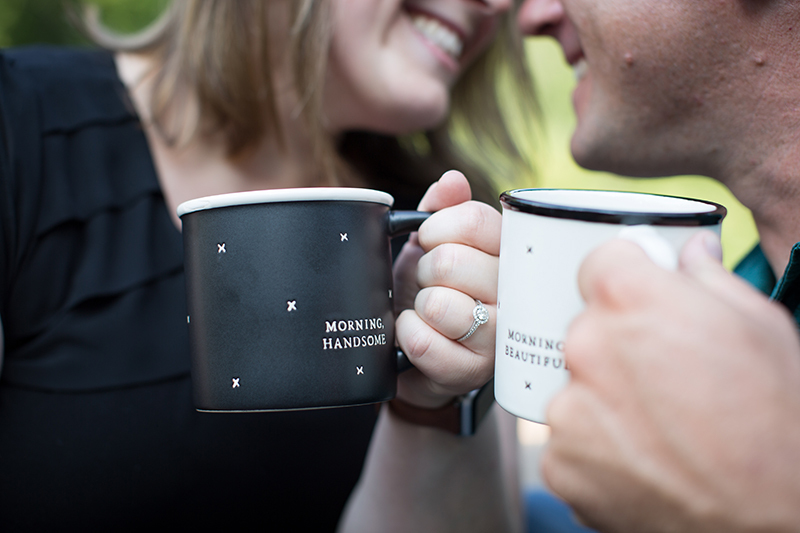 Now that’s just plain adorable, and an easy addition to bring to your engagement session! The whole session doesn’t have to be about these shirts. This couple did an outfit swap after taking most of their images wearing different tops. She likes road cycling, he’s likes the mountain biking trails. After snapping some shots wearing summery clothing they changed into their cycling clothes and brought out the tandem bike. First they frolicked in the snow wearing sweaters and jeans. Then they changed into their nordic ski wear for some photos on their skis! What are your ideas? We’d love to hear them! This couple included many young kids in their wedding day including their own sweet baby boy. Grandparents and trusted friends took turns helping them out with the little guy so that they could enjoy their wedding day while making their special guy part of it! Kids are such an important part of so many people’s lives and it can be a really special moment and memory in their lives to be a part of your wedding day! That can be easier said then done however, there are a lot of things to keep in mind when including kids into your wedding day without too many meltdowns from everyone involved. And so I give you five things to keep in mind when including kids in your wedding party or even if you just plan on having them attend the wedding. I’m not an expert, but most of these things are either things that I’ve seen be successful at weddings over the years, things that I’ve seen people wish they had done, or things I’ve picked up from being a mom myself. 1. Let them take their naps! Maybe the kids don’t come until later in the day. If both of their parents are included in the wedding, one of their trusted friends or relatives could take care of the kids in the morning and bring them to the wedding when it’s time for pictures. If their home isn’t close to where the wedding day events are taking place, offer to provide a hotel room for the kids and their parents or a trusted friend to take a break. It might be hard to find this time for them, but it can be vital to them cooperating throughout the rest of the day! Once the kids arrive/are ready, it’s best to do any photos that you want with them right away. If they’re in a good mood and ready for a picture, seize the moment, it might not come again and you don’t want to be trying to get these precious photos as they’re about to leave! Being flexible and letting kids be kids (to a certain extent) is also important. Choose your battles. This little flower girl wanted to sit next to her momma during the ceremony. No sweat. This may seem like common sense but it’s surprising how fast time can slip away on a wedding day and suddenly it’s 3pm, time to walk down the aisle and no one has eaten lunch. If the kids in your life are anything like my kid, all hope is lost if he’s hungry. In our house we like to call it “hangry”. Have parent approved snacks on hand, crackers, fruit snacks, applesauce, and cheese sticks are all popular choices in our house! 4. Give them something to keep them busy! Every kid is different, but find out what the kids involved in your wedding day are into and get them something new that will keep them occupied during downtime. For the really little kids, books with flaps can keep them busy for a very long time. Coloring/sticker books for the slightly older kids are usually a hit, and for those old enough, put together a lego kit that they can pack up and take with them when it’s time to move and they’ll love you forever! 5. Let them go home early! Most parents can attest, it’s not a good idea to push young kids very long after their bedtime. Staying with the same idea as the morning, if the parents can arrange for someone they trust to pick their kids up from the reception and take them home allowing the parents to stay a little longer and enjoy some kid free time! Outdoor receptions are pretty much perfect for the kiddos. During cocktail hour, let them run their wiggles out and work up an appetite for dinner! Do We Really Need an Engagement Session? As a wedding photographer, I get a lot of questions about the engagement session. So I've decided to answer some of these questions in a series of blog posts about, you guessed it, the engagement session! So, first up: "Do we really need an engagement session?" Well, most of our wedding photography collections include an engagement session, so that can clue you in on how important we think they are. There are a few reasons why I love engagement sessions and also feel like they are important to success and even stress reduction on your wedding day. 1. Getting to know you photographer! The engagement session is the perfect opportunity to get to know your photographer(s) and for your photographer(s) to get to know YOU before your wedding day! Why is this important? We feel that photography is a very personal thing and should reflect you. The more we work together, the more we understand each other, and in turn I can better showcase YOU in your wedding photos! 2. Getting used to the camera! Most people these days are pretty used to camera phones, selfies, and posing for a picture with friends; but when a professional camera comes to the scene, it's a different story. Your wedding day is likely the first time you've had your picture professionally taken since your senior pictures and that can be nerve wrecking! I know how you feel, I freak out when the camera is pointed in my direction, that's why I spend so much time on the other side of it! But if you take an hour in a relaxed location with your photographer before your wedding day, it can really ease those nerves and give you a better idea of what to expect on your wedding day! 3. It's fun! Having your picture taken may not be your idea of fun, but we like to let you have fun with your engagement session. Treat it more as time spent in the park (or wherever you choose) with your loved one. We'll give you some direction on what to do, how/where to stand, but mostly we want you to have fun with each other! 4. The pictures are nice to have! Last but not least, your engagement photos are just really nice to have. They are a nice addition to your wedding photos to pass on to future generations and for your family to enjoy leading up to your wedding day! They also make great additions to save-the-dates, wedding programs, website, and even invitations. So in short, no, you don't need an engagement session. But they can really aide in helping to ease stress and anxiety on your wedding day if you're already comfortable with your photographer(s). The pictures are just plain fun to have, not only for you, but your friends and family too, and they can be a useful addition to visual elements on your wedding day! What is an Unplugged Ceremony and 4 Reasons Why YOU Should Have One! We've been living in the age of smartphones for quite sometime now and the cameras on these little guys have improved so much over the years. This is a great thing! It's led to more pictures of more of life's moments! Which, in my book, is what photography is all about! When it comes to your wedding ceremony however, it's best to nicely ask your guests to pocket their phones, tablets, and cameras for just a little bit. It's easy to politely let your guests know that you are having an unplugged ceremony. Some couples put out a cute sign, others chose to have their officiant make an announcement prior to the ceremony. Now, I know that your guests are so excited for you and they just want to document your special day, maybe catch an angle that your pro might not be in at the moment, or they just want a photo of their own from such a meaningful day that they can look at right away. These images taken by your guests are great, just not during your ceremony and here's why. 1. Your moment: When you come down that aisle, what would you rather see? Your friends and family smiling in your direction as you walk to meet you future spouse? Or, a series of phones pointed in your direction as you crane you neck around them to get a clear view of the one you are about to promise your life to? When you're standing at the top of that aisle, waiting for your bride to appear, what would you rather see? Rectangular screens held in the air, or your beautiful bride beaming back at you? 2. Their moment: As a photographer, I know, it's hard to take in the moment completely with a camera in front of your face. That's why we are here, so they can enjoy the moment, and we can capture it. Asking your guests to stow their phones during your ceremony will allow them to be completely present with you. To laugh with you, cry with you, and really enjoy your ceremony. 3. We've got this: To be blunt, we are professional photographers. We have brought the necessary experience, knowledge, and gear to capture the story of your wedding day for you. We also have the ability to move around during the ceremony, which I highly doubt you want all of your guests to do. Prior to the start of your ceremony, we have walked through the site, found every angle that we think would capture your ceremony best and planned out how we're going to move around as unobtrusively as possible. We have thought out where we want to be and when. We're ready! 4. The pictures you get from us: Last but not least, asking your guests to stow their phones during your ceremony allows us to do our job better. As wedding photographers, we love capturing expressions, emotion, and real moments. It's hard to do that when people are viewing your wedding through their phone. Also, aesthetically, the glowing screens can be distracting in your images. When it comes to an "unplugged" ceremony, I think that its something that a lot of couples don't think about. You don't realize how distracting a "plugged" ceremony can be until you're living it and by then it's too late. All that said, guest pictures are fantastic during other portions of your wedding day. You will surely get some gems from them enjoying your cocktail hour and reception! Your wedding day is not about us and what we want. Its about you, your love, your friends and family, we simply want to capture that for you as purely as possible.